The writing life, one smudged page at a time. What I'm about to tell you isn't new. J. K. Rowling has said this, as did Chuck Wendig, as well as a lot of other writers. Basically, if you want to write, write. 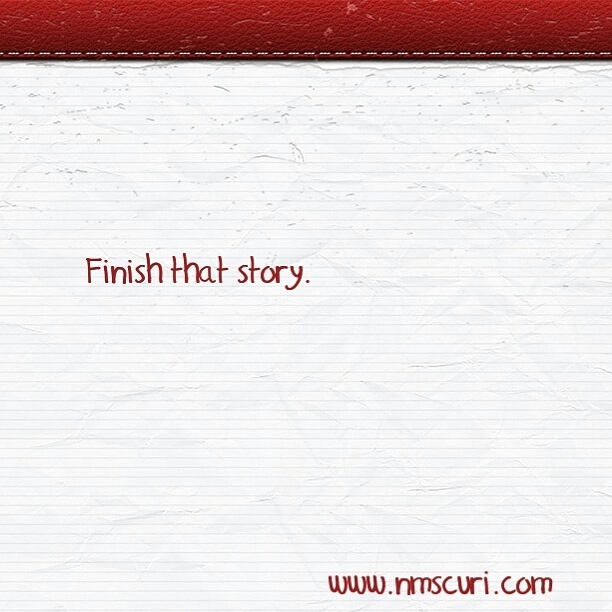 And if you're going to write, you need to finish. Now, this is easy to say, but not always easy to do. Lots of us take up writing, painting, or some other form of creative expression. We abandon creative works for a lot of reasons: lack of time, flagging interest, uncertainty. We can't control everything, but often our issue is with fear. Can I finish this story? Is the story good enough? What if no one likes my work? We all feel it, the anxiety of being a failure, to be found out as a fraud. Even established writers with millions of fans feel it, so you're in good company. But what can you do? The exact process may vary from person to person, but you have to ignore the voices in your head (or the "advice" of well-meaning friends and family) and get to work. You have to put aside the idea that your painting/short story/novel/screenplay is going to be your masterpiece that brings you fame and fortune, and Just Get It Done. It may very well be your breakout work. It probably will not be. It could, however, bring you to a place, teach you a lesson, or just give you the confidence boost that takes you to a place you'd never think you'd be. And isn't that worth trying for? Want the latest news on +TwoSentence Horrors, +N. M. Scuri, and +byron rempel? Sign up for your weekly newsletter here or subscribe to N. M. Scuri's weekly newsletter for all things writing and editing, including upcoming live workshops and editing consultations here. Copyright NM Scuri 2015. Travel theme. Powered by Blogger.